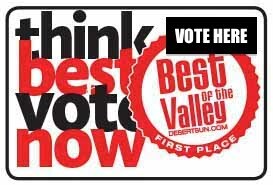 Thanks to so many of you who nominated us in the “Home Improvement” category of the 2015 Best of the Valley awards presented by the Desert Sun. The voting has started and voters are now allowed to vote once each day until Oct 10th for their favorite valley businesses. Please cast your vote for Farley Interlocking Paving. Let’s “Rock the Vote”!